Orange County Patio Cover expertise for over 25 years. The PatioMan in Orange County has been super busy lately and sadly have not had much time to give an update to our Orange County Patio Cover Blog. But I recently completed a fantastic looking aluminum patio cover in Huntington Beach that looked fantastic and something I had to share. There are some patio covers that are pretty straight forward and others that have all sorts of wonderful options and really make full use of all of the wonderful options available for aluminum patio covers. 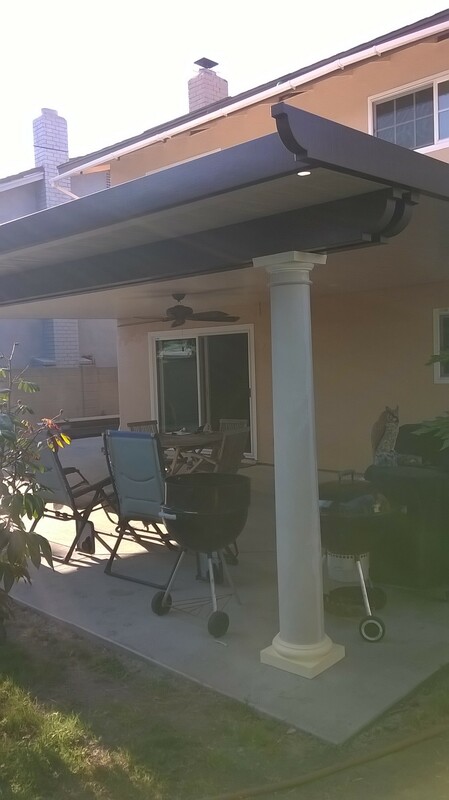 This Huntington Beach Aluminum Patio Cover really had the full Monty of options and so I just had to share some pictures and talk a bit about what we were able to do for the homeowner. Here you can see an angle view of the cover. 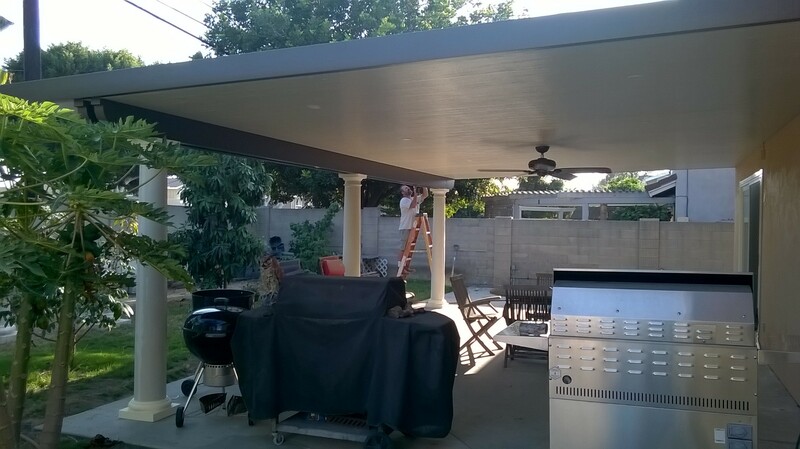 It was a dandy in that the homeowner elected to go with a two tone color scheme going with the Spanish Brown for the Beams and Rafters and using Desert Sand for the panels of this solid aluminum patio cover. One of the benefits of aluminum patio covers is that all of the material comes pre-painted and ready to install when it leaves the factory and there are dozens of options you can choose for colors and styles. In this case, the two tone looks fantastic and was a great choice to correspond with the color of the house. Ceiling Fans and Recessed Lights? Piece of Cake! 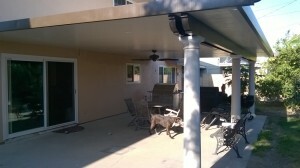 This picture shows some of the extra options this homeowner elected to add to his patio cover. For starters, the ceiling fan is a beautiful touch and will add many year of air circulation in the warm summer months as well as providing a cozy aesthetic. This patio cover also came with 10 recessed LED lights that also are as attractive looking as they are functional with full dimming capabilities. There are so many designer options for aluminum patio covers to choose from. Running electricity through a solid patio cover is a snap and can be used for pretty much anything a home owner desires. Along with ceiling fans, we have installed flat screen tv’s, audio systems, other types of exterior lighting and more. Here is another picture showing the Roman Columns. Roman Columns add a classical look to any cover and can be easily installed. In this case, the homeowner was still deciding on painting the columns or adding a decorative vinyl wrap. Either way, much like the Aluminum Patio Cover itself, Roman Columns also come with many options and can add a distinct look to your Patio. Between the Roman Columns, the Two Tone Color choices, the Ceiling fan, and the recessed lighting- this homeowners patio cover is the envy of his Huntington Beach Neighborhood! As with all Aluminum Patio Covers, they come with a lifetime warranty on the paint and will provide years of enjoyment and cool comfort. If you are looking for a new Huntington Beach aluminum patio cover or anywhere in Orange County please give us a call at (949) 348–1349 for a free quote! We can do simple straight forward patio covers that are cost effective and affordable or for a bit more, like this HB Homeowner choose- get the amazing Patio Cover you have always dreamed of! Follow us on Yelp, Facebook & Twitter!